A key advantage of Kamado Joe’s ceramic vessel is its ability to insulate. Not only does this require less total heat for cooking, it also lets you cook at significantly higher temperatures, or at very low temperatures, for a significantly longer time. Combine this with the ability to not only control, but fine-tune the temperature, and you get a grill that is extremely versatile. Kamado Joe can grill, sear and smoke! Kamado Joe is a grill First and foremost, Kamado Joe is a grill. Its ceramic construction and unique shape, along with using lump charcoal, mean moister meats and wood-fire flavour. 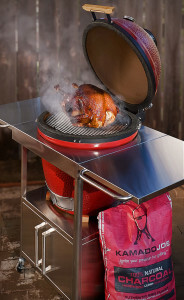 Kamado Joe is a smoker With Kamado Joe’s ability to control temperature, and thanks to the long-burning stamina of lump charcoal, you’ll be able to use your Kamado Joe as a smoker or a slow cooker (it will maintain low temps for up to 12 hours without adding lump charcoal).